Arguably the most desired location on Quantabacook Lake, Loons Nest is the perfect spot for fishing, swimming, and boating on a serene lake in Maine. 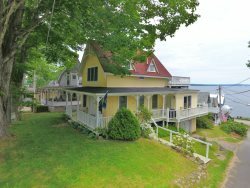 First-time visitors to Maine will love the surrounding pine trees, the call of the loons, and the serenity of this lake house. Enjoy warm summer days on the lake, and evenings enjoying the fire pit or relaxing in the screened-in porch. Loons Nest sleeps 6 comfortably, with a bedroom on each floor and lots of space to congregate. The main-floor bedroom and bath are convenient, and the lower level master allows for lots of privacy, with its own seating area and walk-out access as well as en-suite bathroom. The spacious loft has 2 twin beds and a small sitting area. This A-frame features tons of water-facing windows for watching the lake action. The comfortable indoor living quarters is almost doubled in size with the additional screened-in porch. Enjoy meals or late night board games under lights - or shade from the afternoon sun. The fire pit by the shore is great for roasting marshmallows and enjoying time by the water in the evening. The 12 x 12 dock accommodates swimming and boating from one of the deepest parts on the lake. This property really has everything you need for the perfect lake vacation. BOATS INCLUDED? None, however, if you are looking to rent kayaks, Maine Sport or Ducktrap Kayaks offer those and can deliver them to the Property. We have always enjoyed working with On the Water in Maine. You have met our needs each time. We enjoyed our stay at Loons Nest very much. Did not enjoy that there was no shower in the master area. Loved the living, dining and kitchen area as well as the enclosed screen porch. On the water in Maine was very easy to work with and we had no trouble gaining entry or checking in and out. The Loons Nest was a beautiful vacation home in the scenic town of Searsmont. Our view of the lake was breathtaking! We kayaked to the island in the lake one day and swam while we were over there. (something we would not do in Florida) The water is refreshing and clear and we were able to see the mountains. We both agreed that being in the home and the lake was like stepping into a beautiful portrait. Though there was no a/c in the home, with the powerful ceiling fans and portable fans we were never in need of it. It was so peaceful there and we slept in every morning. The home is centrally located, so going places was not a long trip. Truly cannot say anything bad about this property! A leaky faucet in the kitchen was quickly repaired---thank you. Overall, a very nice rental. Loon's Nest is an attractive,spacious house on a gorgeous lake. The lake is quiet and clean. The house is bright and cheerful. The screen porch is great--we ate there every evening. There is ample space for everyone. The furniture could be in better shape. Prospective renters should know two bedrooms don't have doors,and there is only one shower. A great lakeside house with lots of space. We took our son and his family with us and we were worried that we would be cramped and on top of each other. But the 3 floors in this house were ideal, as the kids were in the loft, our son and daughter-in-law in the lower level and we were on the main floor. We also spent lots of time on the screened in porch. The grandkids had a great time on the lake and we were so glad that we rented a kayak and a paddle board. Always a pleasure to work together with the folks at On The Water in Maine. Always available and professional. We really enjoyed our stay at Loons Nest, it was the perfect combination of house and lake that we have found over our 3 years of renting a lake house in the area. The house was very comfortable, kitchen well equipped and the screened in porch was awesome!